Mr. Mugabe, the country’s new leader, was hailed as a freedom fighter, but during his 37-year rule, the once-prosperous nation fell into economic ruin. A major factor was a violent program, begun in 2000, that confiscated the large commercial properties of white farmers, which was intended to redress inequities but caused economic havoc, although it ultimately led to a boom in small black farms. Mr. Mugabe’s relatives were among the beneficiaries of the land seizures. Frustrated with poor economic performance and Mr. Mugabe’s increasingly authoritarian turn, his neighbors at first suggested that he be put forward as a candidate for the ruling party, ZANU-PF. That idea was dismissed out of hand, and so the neighbors urged Mr. Bennett to join the new opposition party instead. He became a close ally and friend of Morgan Tsvangirai, the opposition leader. In 2003, the Charleswood Estate in Chimanimani, owned by Mr. Bennett and his family, was invaded. Mr. Bennett condemned the seizure as illegal. In a raucous exchange in Parliament the following year, the country’s justice minister, Patrick Chinamasa, told Mr. Bennett that his ancestors had been “thieves and murderers.” A scuffle broke out and Mr. Bennett shoved Mr. Chinamasa to the ground; he was imprisoned for a year for assault. Granted early release for good behavior, Mr. Bennett complained of prison abuses, saying that he had been issued a uniform covered in excrement and lice, and made to stand naked in front of guards. By then, Mr. Bennett had become a top deputy of Mr. Tsvangirai, and he was named the party’s general treasurer. Fearing rearrest, he fled to South Africa in 2006 and was eventually granted asylum there. But he agreed to return in 2008, when Mr. Tsvangirai defeated Mr. Mugabe in the first round of a presidential election. Mr. Mugabe’s supporters complained that white farmers were returning “in droves” to reclaim their land under Mr. Tsvangirai, a charge that Mr. Bennett called “absolute nonsense.” But amid rising violence, Mr. Tsvangirai withdrew from the runoff, following a fierce internal debate. “Pulling out of the elections now would be giving in to a violent dictator who is prepared to wage war on his own people to stay in power,” Mr. Bennett, who was acting as the party’s spokesman, said at the time. Mr. Bennett was named deputy agriculture minister under a power-sharing government led by Mr. Mugabe and Mr. Tsvangirai as prime minister. 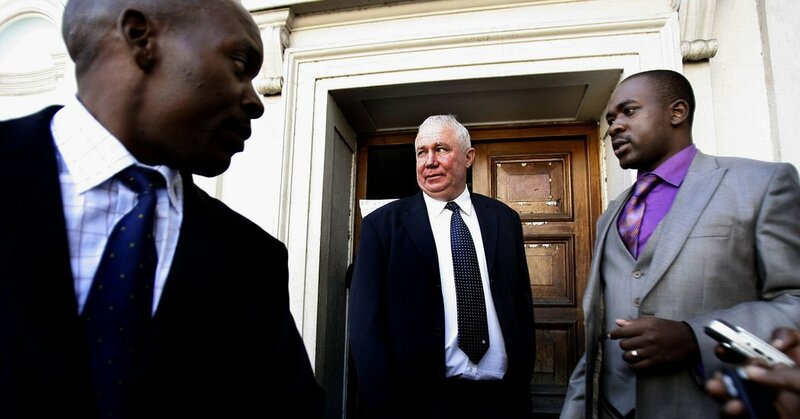 But on his return to Zimbabwe in February 2009, he was promptly arrested and charged with treason, ostensibly in connection with a cache of arms found at his home in 2006. Mr. Tsvangirai denounced the arrest as politically motivated and warned that military intelligence officials — who remained loyal to Mr. Mugabe — had plotted to harm Mr. Bennett. The government’s case was based mostly on testimony from a witness, Peter Michael Hitschman, who, it later emerged, had been tortured — his buttocks were burned with cigarettes — and told that his wife and son would be harmed if he did not implicate Mr. Bennett. The trial began in October 2009. In March 2010, a judge ruled that Mr. Hitschman’s testimony had been coerced. That May, Mr. Bennett was acquitted. Barred from joining the government, Mr. Bennett began to devote most of his time to farming in Zambia and South Africa; he also spent time in Colorado. He is survived by a daughter, Casey, and a son, Charles. Mr. Mugabe resigned in November, after an internal power struggle, and was replaced by his former vice president, Emmerson Mnangagwa, who this week pledged to hold “free and fair” elections in five months.